For the third year in a row, the men’s track and field team won the NESCAC championship. Tufts finished the day just 5.3 team points ahead of Williams to become the second NESCAC team in history to win the competition three years in a row, with 22 different Jumbos playing a part in aggregating the team score of 169.333. The Tufts squad was far from the favorites and individual and team seeding certainly favored a lower finish going into the competition. However, nearly every Tufts competitor either matched or exceeded where they were seeded to perform. “Had anything gone differently, we could’ve easily lost … five points in a track meet is insanely close,” junior sprinter Francis Goins said. The team’s performance included first-place finishes in four different events, one of which was Goins’ first-place finish in the 200-meter dash (22.05 seconds), beating a personal record by 0.95 seconds. The win was not Goins’ only contribution to the team score, however, as the junior finished the 400-meter race in 49.72 seconds to earn a fourth-place finish. Next to top the list in an event was senior Mitch Black. After a fast pace set by Colby sophomore David Chelimo, Black grabbed second in the 1500-meter run in 3:50.70, enough to move him to ninth nationally in the event. A few hours later, he won the 800 to claim his second NESCAC title in as many years with a timing of 1:52.03. Sophomore Luke O’Connor also grabbed all 10 points in the 3000-meter steeplechase with 9:24.18, 10 seconds faster than the next best time. O’Connor was joined by two of his Tufts teammates in the top five; senior co-captain Marshall Pagano and first-year Ty Enos, a cartoonist and comics contributor for the Daily, came in second and fifth, respectively, as the Jumbos grabbed 22 points in total from the event. The final Tufts athlete to finish first in an event was sophomore Nick Usoff. Usoff’s distance of 174’5” in the javelin throw landed him at the front of the pack. The win was Usoff’s first conference win in his career. Two more Jumbos were close behind as well, as senior Patrick Haneberg and junior Atticus Swett earned third and seventh place, respectively. Following his performance in the javelin throw, Usoff then landed in the top five in three different running events, two of them relays. In total, Usoff played a part in earning 30 team points in what was possibly Tufts’ best all-around individual performance of the meet. Swett also earned more points in the other throwing events, landing in fifth in the discus and sixth in the shot put. Senior co-captain Brian Williamson contributed more points, throwing a 172’7” distance in the hammer throw to earn second. In the end, it was the Jumbos’ diversity of good results that carried them to their third NESCAC championship win in a row. 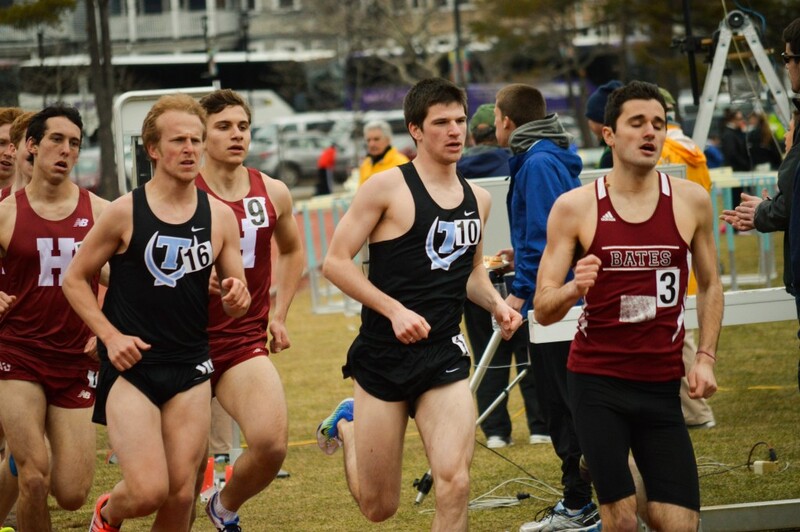 Tufts athletes earned top finishes across all the different events in running, throwing and jumping. Along with four first-place finishes, Tufts also finished as runners-up in six different events. First-year Andrew DiMaiti was one of those runners-up as he led three Tufts athletes into the top five of the 400-meter hurdles. Following DiMaiti were Usoff in third and sophomore Henry Zhou in eighth as the team collected 15 points from the event. The Jumbos continued to notch top-eight finishes in the jumping events as well. First-year Stefan Duvivier, first-year Linus Gordon and sophomore Thomas Wang collected 14.3 points altogether in the high jump. The three finished in second, third and eighth respectively, as Wang finished in a three-way tie to earn a third of a point. In the triple jump, Duvivier and Gordon were once more among the top five, this time with Gordon beating out Duvivier to earn third while his classmate earned fifth. The relay teams capitalized on the team’s momentum, earning top-five spots in all three of the relays. The 4×400 was Tufts’ best relay, as the team of junior Veer Bhalla, junior Alex Kasemir, Usoff and Goins turned in a 3:19.80 time to land in second. The Jumbos earned third and fifth in the 4×100 and 4×800 respectively. Nearly every Tufts athlete needed to surpass how they were expected to perform if the Jumbos were to have any chance of winning the competition — a tall order that the team achieved. “Tufts was just a more balanced team, and those fourths and fifths ended up outweighing those firsts and seconds,” Goins said. Balance may have been the key to success for the team, as it consistently earned top eight finishes in nearly every event. Usoff was buzzing over the team’s performance and the competition as a whole.